The SCH Pro-Drive high performance knife drive in conjunction with the uniquely simple SCH cutterbar system achieve cutting performances that had never been considered possible in the past, particularly in the case of self-propelled harvesters. May Wes Auger Trough Liners covers the full length of the floor under the auger - not just the feed opening. Available for both grain heads and corn heads. For Combines and Swathers - Smoother crop flow, less downtime and superior component strength. Field Tracker allows headers to follow the ground contour, independent of the combine, by automatically tilting from side to side in response to terrain changes. This can greatly increase recovery of the low growing crops, like soybeans when you're harvesting hillsides. Field Tracker kits are available for Case-IH combines. Tested and refined over several harvest seasons by high-hour combine users. The Gateway, HCC’s NEW sieve and chaffer system, is significantly lighter than standard sieves and chaffers found on current combines. The patented design utilizes aluminum and plastic construction for lower frame weight.That reduces wear and tear on cleaning shoe bushings and bearings, extends their life, and reduces combine downtime. The Flip Reel Kit is designed to eliminate wrapping around bat tubes and is particularly effective in soybeans, canola and other tall, stringy crops. Installation is easy and can be done on equipment you already own. Designed as a retro-fit for all HCC tube-type reels built since 1990. ML 4-1/2" tine spacing or Level II 6" tine spacings are designed to work with the Flip Reel Kit. You can install it yourself in just a few hours using the Installation Instruction Manual. OEM replacement knife assemblies are sectional so they can be shipped by UPS. 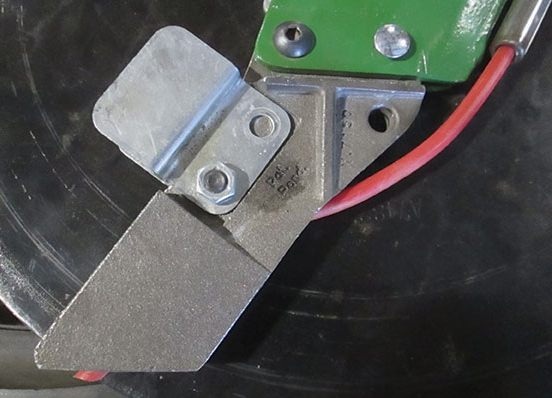 Same high quality parts as original equipment knife assemblies. Includes all hardware for assembly. We also have OEM replacement guards and sections available. The revolutionary, patent-pending design of the Orbit Reel is tailored to today’s high performance headers and brings the reel tines right up to the auger before exiting the crop. PROVEN TO OUTPERFORM AND OUTLAST. Replace your existing metal or worn out poly corn gatherers with GVL Poly Corn Snouts and reap the benefits. Run your head closer to the ground without pushing and piling soil and you will put more crop in the combine even in wet sticky conditions. Poly Skid Shoes are sold in complete kits to outfit an enitre grain head or as individual replacement parts. The Radura disc mower blade has been used throughout the world for over 50 years. Its exceptional quality and durability is the reason why so many professional users, OEMs, or hobby farmers trust radura disc mower blades for their machines. High performance tines for short or sparse crops. The Paddle is a proven tine replacement system that offers true high performance at harvest time. When crop conditions make harvesting difficult and inefficient, the Paddle is the cost-effective alternative to standard tines. Keep your auger feeding smoothly and efficiently. The May Wes Poly Retractable Fingers are an ideal alternative to metal fingers because they are far less damaging when a metal finger breaks and is fed through the combine. Unlike metal, broken poly will disintegrate before causing equipment damage. SCH Croplifters for OEM guards, SCH EasyCut I and SCH EasyCut II guards. Schumacher pulse crop lifters combine simple design with durability for your easy pulse crop harvest. With the specifically designed slot, the PRO FLEX LIFTER can fit perfectly on most types of guards. That's why the SCH pulse lifter guarantees a tight fit. Stalk Stompers available for John Deere, Case-IH, New Holland, Drago, Geringhoff Northstar, Geringhoff, Horizon, Lexion, AGCO, Harvestec, Fantini and Capello cornheads. Tractor stalk stompers available for Case-IH, Challenger, John Deere and New Holland. A metal tube that installs on end of fan exhaust above chopper or power tailboard. Blows off dust and trash that builds up on the tailboard. Fits John Deere S-Series combines; S550, S650, S660, S670, S680, S690, S760, S770, S780 and S790. Unloading Auger Extensions for Case-IH, Gleaner and John Deere. Unloading augers for Gleaner, Case-IH, John Deere and Massey Ferguson. Specializes in No-Till & Reduced-Tillage planting and drilling equipment, fertilizer application tools, and chisel plow tools. Acre Plus Seed Box topper, are color matched injected molded plastic Seed Box extentions that fits the original seed box and use existing seed box lid. Adds one bushel to seed box capacity. Save time, labor and money. The Air Design scraper will outlast and outwear standard planter scrapers. The scraper features a special tungsten carbide cutting edge. You'll get superior performance and reduce tedious replacement chores. Setting row cleaners is a pain. CleanSweep lets you do it from your cab. Closing wheels including cast closing wheel, Close-N-Till wheels, Finger-Till closing wheels and Rubber closing wheels. Replaces the original depth stop and allows the depth gauge wheels to follow the ground terrain allowing the planter unit to travel smoothly in all field conditions. Fits John Deere & Kinze planters. This Package Equals or Exceeds Competitive Designs in Down Force in the Normal Working Range. This special blend of talc and graphite improves seed loading and seed release – and that improves seed spacing. eFlow improves the flow of seed from the hopper to the meter. Gauge Wheel Assemblies available for John Deere planters, John Deere drills, Kinze planters, Great Plains planters, Monosem planters and White planters. Gauge Wheel Tires for Case-IH planters, Case-IH air drills, John Deere planters, John Deere drills, Kinze planters, New Holland planters and White planters. Keeton Seed Firmers set the seed at the right depth and create consistent seed-to-soil contact. That leads to uniform germination, uniform emergence and test show a average increase of up to six bushels per acre. Population Monitor for Planters and Grain Drills. We can also supply you with a custom harness built specifically for your planter or drill. Martin Planting Attachments including, Floating Row Cleaners, Fixed Row Cleaners, Fertilizer Opener, Spading Closing Wheels & Drag Chains. Graphite, Kinze Brush Meter Adapter, etc. Patented open rim design reduces mud and debris build-up. Improves planting efficiency during wet soil conditions. Modular construction allows every part to be field replaceable. Cast iron bearing hub eliminates wheel wobble and reduces time spent changing bearings. Widths of 4" for conventional planters, 3" for no-till and high speed planters, 2.5" for no-till and twin row planters. Replace worn bushing in parrallel linkage for John Deere and Kinze Planters. Parallel Linkage Flanged Bushing Rebuild Kits are BETTER THAN NEW. Worn parallel linkage arms and bushings are a common problem with today's planters and with the newer high-speed planters, the likelihood is that the problem will only get worse. In the past, worn parallel linkage arms and bushings have always had to be replaced with new and expensive ones. Precision Planter Solutions offers a solution that will make your old and worn parallel linkage arms and bushings better than new. 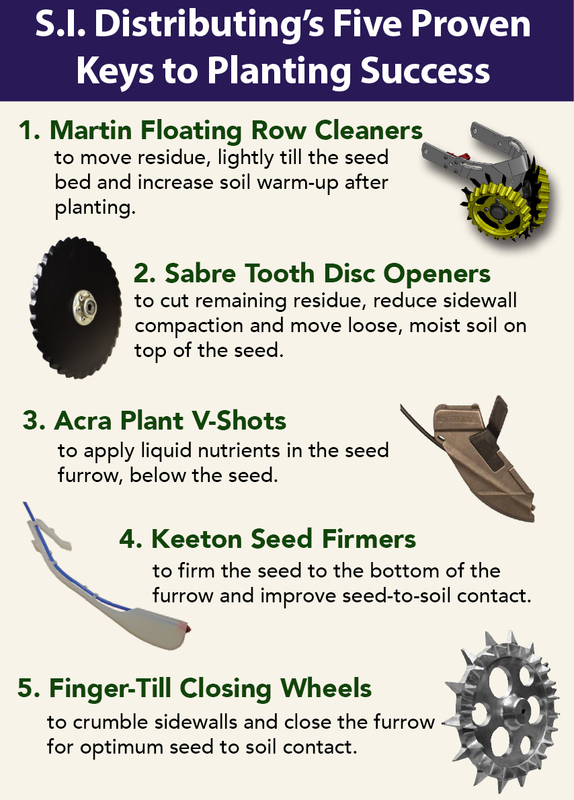 The design of the PTT Sabre Tooth Planter Disc Opener allows it to cut, rotate and flow moist granulated soil on top of seed placement for maximizing seed-to-soil contact. PTT’s Sabre Tooth Planter Disc Opener eliminates the need for a leading no-till coulter assembly and to facilitate closing of the seed furrow with standard OEM equipment. The disc openers will leave 1/4” of granulated soil on top of the seed even in wet harsh conditions to get better seed to soil contact with less sidewall compaction. The SI Belt Meter will singulate the seed and maintain an accurate population control over a wide range of seed sizes. (2,000 to 4,000 actual seeds per pound). Now you can plant the seed population per acre you choose without guessing or adjusting your drill each time that you change seed sizes. Keep your V-Closing wheels free of old stalks, lumps of soil and other field debris. Valion seed tube guards will eliminate seed tube wear and greatly reduce blade flex to create a properly shaped furrow and improved planting depth control. These guards are perfect for no-till or high-wear conditions, or anyone who is simply tired of replacing seed tube guards so often. While intended to limit blade flex, standard OEM seed tube guards can wear substantially in just a few hours of use. Closing Wheel Brackets for your John Deere, Kinze, Case-IH & White Planters. The Original 40-Cell flat corn plate with improved singulator and seed guide. The Only Sensor That Can Tell Seeds From Dust. OPTICAL SENSORS ARE EASILY FOOLED. Revolutionary WaveVision doesn’t use optics. This sensor-seed tube combination uses high-frequency waves to look at falling objects from every angle. Get it right the first time! Grain handling alignment sensor. Our cameras are durable and are a perfect solution to help eliminate your blind spots. Tool storage so advanced you will feel as though you are working in the future. EMPTY YOUR SEED BOXES DIRECTLY INTO YOUR PLANTER. Quick attach for safe unloading. Test Stand belt for S.I. Distributing's meter test stand and Precision Planting's MeterMax test stand. Please select the make of your planter or drill below to view all of the products available for your model.